You might have noticed an icon prompting you to update Chrome on your Windows PC and Mac. On Android, this was handled by the Play Store app. Just like any other app, you will see an update available notification from the Play Store. If you have set your apps to auto-update, Chrome will also be updated. Google is testing a prompt within the Chrome app to encourage users to update Chrome. This will help those who do not auto-update their Android apps. Using the latest version of apps is one of the security best practices. 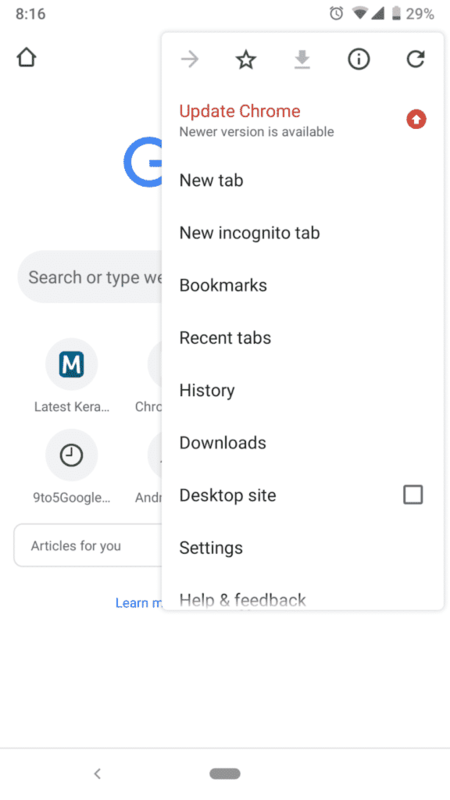 So we can even call this a step towards helping users keep their browser up to date. When I tapped this, the Play Store page for Google Chrome Canary opened and I tapped the “Update” button to download the latest version of the app. We should see this in the stable version of Chrome in coming weeks. If you have set apps to auto update, your chances of noticing this prompt is less, but if you do, you know what it is!